Providing cancer patients with loving care packages is now just a few mouse clicks away at KareKrate.com. Designed to help patients cope with the most common side effects of chemotherapy treatments, Kare Krate care packages provide a convenient way to support friends or loved ones diagnosed with cancer. We are proud to partner with Kare Krate for a special package featuring Chemo Ducks, furthering our mission to support little ones diagnosed with cancer. 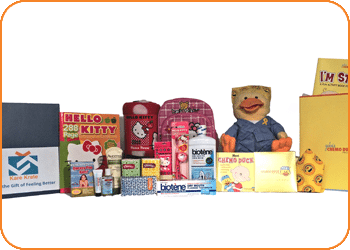 The Comfy and Complete care packages include the basics plus extra comfort items that help make treatments at the hospitals or at home a little more cozy.